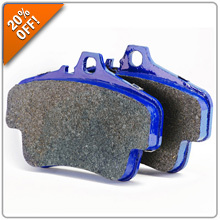 20% Off Cool Carbon Brake Pads for Porsche & BMW! Are your stock pads just not cutting it anymore? Check out Cool Carbon's line of performance brake pads for your Porsche or BMW and experience excellent bite, fade resistance, low dust and virtually no noise. Not to mention you can have this incredible stopping power and still safely use them with your OE rotors. Take advantage of 20% OFF now through December 14th when you enter promo code CARBON20 during checkout. CLICK HERE to purchase for your Porsche today! CLICK HERE to purchase for your BMW today! Last edited by Dmitry at Pelican Parts; 12-07-2017 at 01:42 PM. Take advantage of the savings - offer ends tomorrow!